Absolute bioavailability compares the bioavailability of the active drug in systemic circulation following non-intravenous administration (i.e., after oral, ocular, rectal, transdermal, subcutaneous, or sublingual administration), with the bioavailability of the same drug following intravenous administration. It is the fraction of the drug absorbed through non-intravenous administration compared with the corresponding intravenous administration of the same drug. The comparison must be dose normalized (e.g., account for different doses or varying weights of the subjects); consequently, the amount absorbed is corrected by dividing the corresponding dose administered. 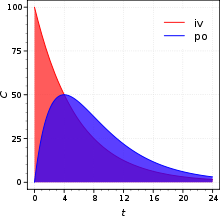 In pharmacology, in order to determine absolute bioavailability of a drug, a pharmacokinetic study must be done to obtain a plasma drug concentration vs time plot for the drug after both intravenous (iv) and extravascular (non-intravenous, i.e., oral) administration. The absolute bioavailability is the dose-corrected area under curve (AUC) non-intravenous divided by AUC intravenous. The formula for calculating the absolute bioavailability, F, of a drug administered orally (po) is given below (where D is dose administered). Therefore, a drug given by the intravenous route will have an absolute bioavailability of 100% (f = 1), whereas drugs given by other routes usually have an absolute bioavailability of less than one. If we compare the two different dosage forms having same active ingredients and compare the two drug bioavailability is called comparative bioavailability. Although knowing the true extent of systemic absorption (referred to as absolute bioavailability) is clearly useful, in practice it is not determined as frequently as one may think. The reason for this is that its assessment requires an intravenous reference; that is, a route of administration that guarantees all of the administered drug reaches systemic circulation. Such studies come at considerable cost, not least of which is the necessity to conduct preclinical toxicity tests to ensure adequate safety, as well as potential problems due to solubility limitations. These limitations may be overcome, however, by administering a very low dose (typically a few micrograms) of an isotopically labelled drug concomitantly with a therapeutic non-isotopically labelled oral dose (the isotopically-labelled intravenous dose is sufficiently low so as not to perturb the systemic drug concentrations achieved from the non-labelled oral dose). The intravenous and oral concentrations can then be deconvoluted by virtue of their different isotopic constitution, and can thus be used to determine the oral and intravenous pharmacokinetics from the same dose administration. This technique eliminates pharmacokinetic issues with non-equivalent clearance as well as enabling the intravenous dose to be administered with a minimum of toxicology and formulation. The technique was first applied using stable-isotopes such as 13C and mass-spectrometry to distinguish the isotopes by mass difference. More recently, 14C labelled drugs are administered intravenously and accelerator mass spectrometry (AMS) used to measure the isotopically labelled drug along with mass spectrometry for the unlabelled drug. There is no regulatory requirement to define the intravenous pharmacokinetics or absolute bioavailability however regulatory authorities do sometimes ask for absolute bioavailability information of the extravascular route in cases in which the bioavailability is apparently low or variable and there is a proven relationship between the pharmacodynamics and the pharmacokinetics at therapeutic doses. In all such cases, to conduct an absolute bioavailability study requires that the drug be given intravenously. Intravenous administration of a developmental drug can provide valuable information on the fundamental pharmacokinetic parameters of volume of distribution (V) and clearance (CL). In pharmacology, relative bioavailability measures the bioavailability (estimated as the AUC) of a formulation (A) of a certain drug when compared with another formulation (B) of the same drug, usually an established standard, or through administration via a different route. When the standard consists of intravenously administered drug, this is known as absolute bioavailability (see above). Relative bioavailability is one of the measures used to assess bioequivalence (BE) between two drug products. For FDA approval, a generic manufacturer must demonstrate that the 90% confidence interval for the ratio of the mean responses (usually of AUC and the maximum concentration, Cmax) of its product to that of the "brand name drug"OB[›] is within the limits of 80% to 125%. Where AUC refers to the concentration of the drug in the blood over time t = 0 to t = ∞, Cmax refers to the maximum concentration of the drug in the blood. When Tmax is given, it refers to the time it takes for a drug to reach Cmax. While the mechanisms by which a formulation affects bioavailability and bioequivalence have been extensively studied in drugs, formulation factors that influence bioavailability and bioequivalence in nutritional supplements are largely unknown. As a result, in nutritional sciences, relative bioavailability or bioequivalence is the most common measure of bioavailability, comparing the bioavailability of one formulation of the same dietary ingredient to another. The absolute bioavailability of a drug, when administered by an extravascular route, is usually less than one (i.e., F< 100%). Various physiological factors reduce the availability of drugs prior to their entry into the systemic circulation. Whether a drug is taken with or without food will also affect absorption, other drugs taken concurrently may alter absorption and first-pass metabolism, intestinal motility alters the dissolution of the drug and may affect the degree of chemical degradation of the drug by intestinal microflora. Disease states affecting liver metabolism or gastrointestinal function will also have an effect. Each of these factors may vary from patient to patient (inter-individual variation), and indeed in the same patient over time (intra-individual variation). In clinical trials, inter-individual variation is a critical measurement used to assess the bioavailability differences from patient to patient in order to ensure predictable dosing. In comparison to drugs, there are significant differences in dietary supplements that impact the evaluation of their bioavailability. These differences include the following: the fact that nutritional supplements provide benefits that are variable and often qualitative in nature; the measurement of nutrient absorption lacks the precision; nutritional supplements are consumed for prevention and well-being; nutritional supplements do not exhibit characteristic dose-response curves; and dosing intervals of nutritional supplements, therefore, are not critical in contrast to drug therapy. In addition, the lack of defined methodology and regulations surrounding the consumption of dietary supplements hinders the application of bioavailability measures in comparison to drugs. In clinical trials with dietary supplements, bioavailability primarily focuses on statistical descriptions of mean or average AUC differences between treatment groups, while often failing to compare or discuss their standard deviations or inter-individual variation. This failure leaves open the question of whether or not an individual in a group is likely to experience the benefits described by the mean-difference comparisons. Further, even if this issue were discussed, it would be difficult to communicate meaning of these inter-subject variances to consumers and/or their physicians. One way to resolve this problem is to define "reliable bioavailability" as positive bioavailability results (an absorption meeting a predefined criterion) that include 84% of the trial subjects and "universal bioavailability" as those that include 98% of the trial subjects. This reliable-universal framework would improve communications with physicians and consumers such that, if it were included on products labels for example, make educated choices as to the benefits of a formulation for them directly. In addition, the reliable-universal framework is similar to the construction of confidence intervals, which statisticians have long offered as one potential solution for dealing with small samples, violations of statistical assumptions or large standard deviations. ^ TH: One of the few exceptions where a drug shows F of over 100% is theophylline. If administered as an oral solution F is 111%, since the drug is completely absorbed and first-pass metabolism in the lung after intravenous administration is bypassed. ^ OB: Reference listed drug products (i.e., innovator's) as well as generic drug products that have been approved based on an Abbreviated New Drug Application are given in FDA's Orange Book. ^ Heaney, Robert P. (2001). "Factors Influencing the Measurement of Bioavailability, Taking Calcium as a Model". The Journal of Nutrition. 131 (4): 1344S–8S. doi:10.1093/jn/131.4.1344S. PMID 11285351. ^ Heaney, Robert P. (2001). "Factors Influencing the Measurement of Bioavailability, Taking Calcium as a Model". The Journal of Nutrition. 131 (4 Suppl): 1344–1348S. doi:10.1093/jn/131.4.1344S. PMID 11285351. ^ a b Srinivasan, V. Srini (2001). "Bioavailability of Nutrients: A Practical Approach to In Vitro Demonstration of the Availability of Nutrients in Multivitamin-Mineral Combination Products". The Journal of Nutrition. 131 (4 Suppl): 1349–1350S. doi:10.1093/jn/131.4.1349S. PMID 11285352. ^ Hinsinger, Philippe (2001). "Bioavailability of soil inorganic P in the rhizosphere as affected by root-induced chemical changes: a review". Plant and Soil. 237 (2): 173–195. doi:10.1023/A:1013351617532. ^ Ma, Qi-Ying; Traina, Samuel J.; Logan, Terry J.; Ryan, James A. (1993). "In situ lead immobilization by apatite". Environmental Science & Technology. 27 (9): 1803–1810. doi:10.1021/es00046a007. ^ Sims, G.K.; Radosevich, M.; He, X.-T.; Traina, S. J. (1991). "The effects of sorption on the bioavailability of pesticides". In Betts, W. B. (ed.). Biodegradation of Natural and Synthetic Materials. London: Springer. pp. 119–137. ^ O'Loughlin, Edward J.; Traina, Samuel J.; Sims, Gerald K. (2000). "Effects of sorption on the biodegradation of 2-methylpyridine in aqueous suspensions of reference clay minerals". Environmental Toxicology and Chemistry. 19 (9): 2168–2174. doi:10.1002/etc.5620190904. ^ Sims, Gerald K.; Cupples, Alison M. (1999). "Factors controlling degradation of pesticides in soil". Pesticide Science. 55 (5): 598–601. doi:10.1002/(SICI)1096-9063(199905)55:5<598::AID-PS962>3.0.CO;2-N.
^ Lappin, Graham; Rowland, Malcolm; Garner, R. Colin (2006). "The use of isotopes in the determination of absolute bioavailability of drugs in humans". Expert Opinion on Drug Metabolism & Toxicology. 2 (3): 419–427. doi:10.1517/17425255.2.3.419. PMID 16863443. ^ a b Lappin, Graham; Stevens, Lloyd (2008). "Biomedical accelerator mass spectrometry: Recent applications in metabolism and pharmacokinetics". Expert Opinion on Drug Metabolism & Toxicology. 4 (8): 1021–1033. doi:10.1517/17425255.4.8.1021. PMID 18680438. ^ Hoag, Stephen W.; Hussain, Ajaz S. (2001). "The Impact of Formulation on Bioavailability: Summary of Workshop Discussion". The Journal of Nutrition. 131 (4 Suppl): 1389–1391S. doi:10.1093/jn/131.4.1389S. PMID 11285360. ^ Kagan, Daniel; Madhavi, Doddabele; Bank, Ginny; Lachlan, Kenneth (2010). "'Universal' and 'Reliable' Bioavailability Claims: Criteria That May Increase Physician Confidence in Nutritional Supplements" (PDF). Natural Medicine Journal. 2 (1): 1–5. ^ Schuppan, D.; Molz, K. H.; Staib, A. H.; Rietbrock, N. (1981). "Bioavailability of theophylline from a sustained-release aminophylline formulation (Euphyllin retard tablets) – plasma levels after single and multiple oral doses". International Journal of Clinical Pharmacology, Therapy, and Toxicology. 19 (5): 223–227. PMID 7251238. Rowland, Malcolm; Tozer, N. (2010). Clinical Pharmacokinetics and Pharmacodynamics: Concepts and Applications (4 ed.). Philadelphia, PA: Lippincott Williams & Wilkins. ISBN 978-0-7817-5009-7. Hauschke, Dieter; Steinijans, Volker; Pigeot, Iris (2007). "Metrics to characterize concentration-time profiles in single- and multiple-dose bioequivalence studies". Bioequivalence Studies in Drug Development: Methods and Applications. Statistics in Practice. Chichester, UK: John Wiley and Sons. pp. 17–36. ISBN 978-0-470-09475-4. Retrieved 21 April 2011. Chow, Shein-Chung; Liu, Jen-pei (15 October 2008). Design and Analysis of Bioavailability and Bioequivalence Studies. Biostatistics Series. 27 (3rd ed.). , FL: CRC Press. ISBN 978-1-58488-668-6.